1. Bring 6 cups of water to a boil and add macaroni elbows. 2. In a separate sauce pan bring heavy cream to a simmer on low heat and add white American cheese and Velveeta. Stir to desired thickness, then remove from heat. 3. Remove macaroni elbows from water after 7-9 minutes for al dente (check the package for specific cooking instructions). 4. Combine macaroni elbows and cheese sauce in a bowl and set aside. Keep covered to preserve heat. 5. Place bacon on griddle and fry until just before crisp. Remove from griddle and set aside. 6. Salt and pepper both Schweid & Sons “The All Natural” burgers and toss onto grill (skillet or flat top griddle works best). 7. Grill Burgers to order (recommended: medium rare). 8. Just before the Burgers are done, toss butter onto griddle and place Martin’s Sandwich Potato Roll, open-faced down onto butter to grill. 9. 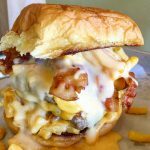 Remove Burgers and Martin’s Sandwich Potato Roll from grill and get ready to expect a messy plate. 10. 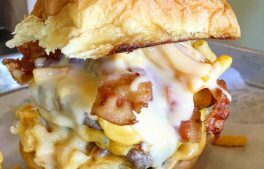 Place Burgers on bottom half of bun, add bacon, and smother in desired amount of mac and cheese. Enjoy!